I ran across the word floriferous recently in one of my gardening books. It's a fun word to say and it means capable of bearing many flowers. I like that word, don't you? Just wanted to give an update on the pictures of our flower beds. We moved here last summer and all gardening efforts are from this year. We are happy campers with the way things have gone so far. Some plants have worked where we put them and some have not. Here's my garden cart all filled to the brim. You can see the beginning here. The backyard is filling in nicely too. I'm not going too up-close with these because....I need to pull Bermuda grass out of the beds. That's a never ending battle! This flower bed has some shared plants in it. Purple heart and iris from my dad and amaryllis from my husband's grandmother. racoons, bobcats, squirrels, owls and many other types of birds. Many of my neighbors don't like that it is so wild... meaning...there are lots of snakes. Yeah, I know. They are so creepy. But it is their habitat and maybe we should leave it alone. I'm so thankful for this spot of nature. Are your gardens floriferous this year? I'm not sure what to fix on my settings (referring to your comment). Can you help me out with some hints? Thanks. Your flowers are awesome! Thank you for teaching me a new word! Your flowers are gorgeous. We really need to replant our beds...they are looking straggly! In your second photo, there is a purplish flower that makes a little pom pom on top. Did you know that you can cut and just let them air dry and the will maintain their color? I had them a few years ago and had colorful dry ones for year round! Sweet hugs! Your flower beds look so beautiful! All your hard work paid off! How wonderful to have wild life right outside your door. I miss that from our old house. I am so happy that you shared this update, and like I've said often, you are a most gifted gardener! What beauty you shared today! Your gardens are beautiful and certainly floriferous. (Always love learning a new word.) Unfortunately I lost my little secret garden to the chickens...guess it wasn't so secret, huh? Looking at all the growth in your beautiful flower beds, it is hard to believe you planted everything this year. Your garden is beautiful! I'm always pulling grass out of my beds, that creeping grass drives me crazy too! Stacey, your gardens are just beautiful! Love the new word! Wish my flowers were as floriferous as yours! The heat has really taken a toll on my summer flowers and I'm already looking forward to a floriferous Fall. Your gardens are lovely. This house we moved in to last November has some wonderful landscaping. However a lot is over grown and we have had so much rain this summer it has been hard to divide and conquer! Your gardens are looking beautiful!! Love all the flowers. Hi Stacey, you have lovely garden. Floriferous - what a great word. I seem to remember you early photos when you moved in and it is amazing to see the change. My garden is floriferous, but the bermuda grass is keeping me on my toes. I love that you have a greenbelt behind your house. How neat to have all those little visitors! (especially the bunnies!) We have something similar behind our house and my hubby just found a little garden snake on our patio last night! Your flowers look great! Is that your lantana I see? I planted some in the Spring, and it just now finally started to grow. It's probably grown a foot in the past month. I don't know why it took so long to get started. Beautiful pics!! Beautifully bold and bright blooms, Stacey! Love your stone exterior; it's storybook sweet!! You've done a wonderful job with your landscaping. It looks great and, yes, floriferous too. Our abundant rain has made it floriferous here as well :). Bobcats and coyotes... oh my! Your flower bed had filled in so pretty. You did not plant too closely. I always do that and things have to be moved later on. I have a warren of rabbits this year. Never had them before-the Black Eyed Susan's have all been eaten. Your garden is gorgeous!!!! Just love that cart!!! Floriferous is certainly an accurate description of your garden! Just beautiful! My hydrangeas were definitely NOT floriferous but my black eyed susans are! I guess I can't have it all. I love the garden you put along your fence. It's perfect! Floriferous is a great word and your gardens certainly are! Such nice landscaping, your gardens are beautiful! Is that white Periwinkle? Love all that color Stacey and all those blooms! Unless it's in a pot or a very hearty perennial, I'm not having much luck this year, especially with my hydrangeas! :) I could use your green thumb! I just love how full and lush your front flower garden is filling in! It looks so pretty against the brick and stone on your house. Looks like you live in a pretty subdivision. The greenbelt behind your backyard is pretty too. We have wildlife around us, but not anything threatening other than snakes. I recently encountered a poisonous snake beside our driveway one night. Scared me half to death! I screamed for my husband. I was worried it might try to crawl into our garage. He relocated him further away after ignoring my pleas for him to just kill it! I also saw one while in Florida last week. They give me the willies!!! What a great job you have done on your flower gardens! They have certainly filled in beautifully. Stacey, your yard looks beautiful! You've done such a great job in both front and back. Wow, those beds are filling really nicely! Mine are slowly coming along but I need a lot more plants still. I'm trying to find neighbors that might be willing to gift some thinnings this fall... we'll see but that would really help things along. Love all the photos and pretty color mixes! Your gardens are looking just gorgeous! Love the color combos and your crepe myrtles are so pretty in the backyard! I love living on a greenbelt...we have lots of nature and wildlife and it makes for lots of adventures in our own backyard. I hate snakes...but thankfully haven't had any lately. Enjoy the fruits of your labor and your greenspace! Your garden is gorgeous!! Mine is most definitely non-floriferous :) I am a lousy gardener, because I can't ever figure out why some things don't work. For example, in my two planters at the front of my house, I have the same petunias. In one planter, they are flourishing. In the other, they're practically dead. I have no clue why! Stacey, your flowers definitely fall into the floriferous category! I like that word too. Love all your flower beds and the flower cart is gorgeous! I really like your black wrought iron fence in the back. We back up to the woods too and i love it! Thanks for viisitng my blog and leaving a comment. I really love new visitors. 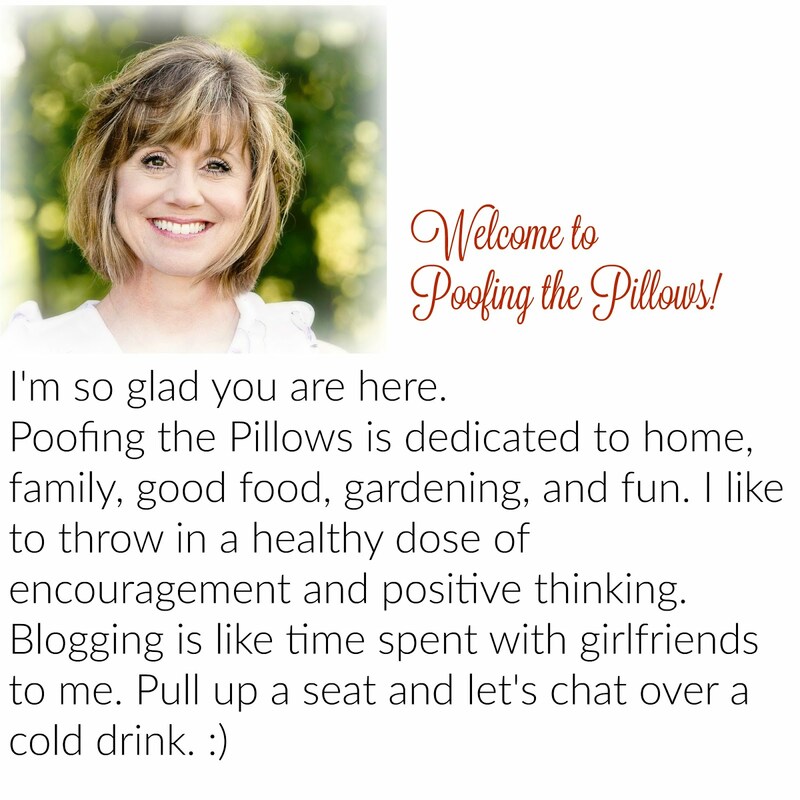 Your blog banner is great. I love red and white together. Your banner looks very vintage but chic. Floriferous. Not only a great word but fun to say! :) You and your gardens are definitely beautiful AND floriferous! My gardens would be a bit more floriferous if I paid a bit more attention to them. Hope you're having a wonderful summer! Hi Stacey! How are you doing? Are you teaching again this coming year? Well, fall will be upon us before we know it. Your garden is so pretty, Stacey. I bet you enjoy having the greenbelt behind your home, too. My garden looks pretty good, except for the geraniums. I don't think they like all the rain we've had this summer! Our vincas are out of control this year! A little fertilizer and they just exploded. I love the wildlife area in your back yard....just lovely! Stacey, I'm just getting caught up on my blog reading. Your flowers look great! Our vincas go crazy every year. Everything here was looking great, until we left for vacation for 10 days, a week or so ago. Needless to say, with the 100 degree temps, the native plants did great; but some of the annuals in pots are toast...lol!! I'm nursing the rest back to health. Hopefully, they will hold on for me, until pansy season. Your flower beds are beautiful! Either this Fall or next Spring, I will have to thin mine out! The banana trees and elephant ears are trying to take over! Thanks for popping in to see me, Stacey. Your gardens look amazing, Stacey. Your new home is beautiful. Hi Stacey, your flowers look beautiful! Hope all is well with you and yours. Stacey, The flower beds look so colorful, and beautiful! And, your home and neighborhood is gorgeous!